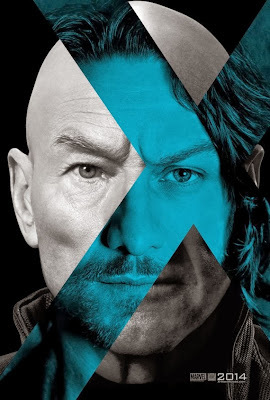 I'm posting this new trailer for X-MEN: DAYS OF FUTURE mainly for you, fangirls and boys, because I can't really call myself a fan of this particular comic book film franchise (the more I think about the 2011 kiddie prequel, X-Men: First Class, the less I care about it). But any chance for me to see Michael Fassbender on the big screen, is a good thing to me! Much of the casts from previous installments return for this new film, including Fassbender, Hugh Jackman, Halle Berry, James McAvoy, Jennifer Lawrence, Anna Paquin, Nicholas Hoult, Ellen Page, Patrick Stewart and Ian McKellan. Evan Peters and Peter Dinklage join the series as Quicksilver and Bolivar Trask, respectively. Bryan Singer, who helmed X-Men and X2, returned for this film. X-Men: The Last Stand writer Simon Kinberg penned the script. The ultimate X-Men ensemble fights a war for the survival of the species across two time periods in X-MEN: DAYS OF FUTURE PAST. The beloved characters from the original “X-Men” film trilogy join forces with their younger selves from “X-Men: First Class,” in an epic battle that must change the past—to save our future. Looks like it could be fun, but I'll let you dissect it further and tear it apart if you must. X-MEN: DAYS OF FUTURE is in theaters May 23rd, 2013. I love the X-Men, but I'm in the same boat with you, the more I think about First Class, the less I like it. I think I could almost edit my review of it and change it completely. I'm looking forward to this one to see our Old mutants, but the new ones still feel horribly out of place. This next X-Men film is what I've been looking forward to the most and yet this trailer didn't excite me. Same with Captain America sequel trailer! I hope they are just teasing us right now!